Problem: Cottage had a wet, musty dirt crawl space. Solution: We encapsulated it with the Clean Space liner and installed perimeter drainage with a SmartSump. Problem: This crawl space was damp – even wet in areas – and required improved drainage for a healthy, dry environment. Solution: Our Advanced Basement crawl space specialist installed a sump pump specifically designed for the unique needs of a crawl space. Then our team encapsulated the entire crawl space with a CleanSpace liner which stops water vapour and humidity from entering the area, and keeps moisture levels acceptable and the crawl space nice and dry. We have a 300sqft cold cellar located underneath our porch. The ceiling and walls have been insulated. Floor is uninsulated concrete. There are four ventilation openings but we usually plug them up. Cold cellar is isolated from our conditioned basement by an exterior-grade steel door. We currently run a portable dehumidifier in there but if we don't keep on top of it then we get mold issues. We would like to install a permanent, self-sufficient dehumidifier in there. We will need to pump the condensate to the outdoors through one of the vents at the ceiling (8ft high walls) as there is no drain nor sump pit in the cold cellar. 110VAC plug preferred but could go hard-wired if need be. We not only adhere to the highest industry standards, we strive to be the industry leader in the home improvement related services we provide. We also use state-of-the-art products and technology which are designed to fix your home. 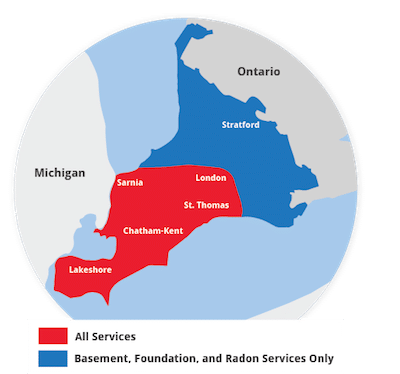 We are the authorized Basement Systems dealer in Port Lambton, ON. This before photo shows you what could be under your feet! Lumpy ground, moisture and critters. When you have ABS renovate your crawl space, it benefits the whole home above it. You can see the entry into the crawl space on the far wall. It is now easy for the home owner to not only get into the area, but to crawl about it also. It's now clean, dry and attractive under the home. Our very thick and durable Clean Space Liner will withstand you crawling on it, as well as other contractors! Not to mention it looks great.